One thing I’ve been really grateful for the past few months is my small, but amazing garden. I owe it all to my husband and son, who do all the planting and maintenance so that I get to reap all the benefits of having fresh vegetables, fruits, and herbs. It’s truly wonderful to be able to pick your own produce and create a meal composed mainly of organic home-grown ingredients. We’ve had a great harvest these past few months, including vine-ripe tomatoes, eggplants, jalapenos, green, red and yellow bell peppers, poblano peppers, serrano peppers, sweet and thai basil, parsley, rosemary, thyme, cilantro, chives, lemons, and an enormous tree with more than 20 pomegranates. With all this fresh home-grown produce, the pressure sometimes kicks in to use all of it before it goes bad. 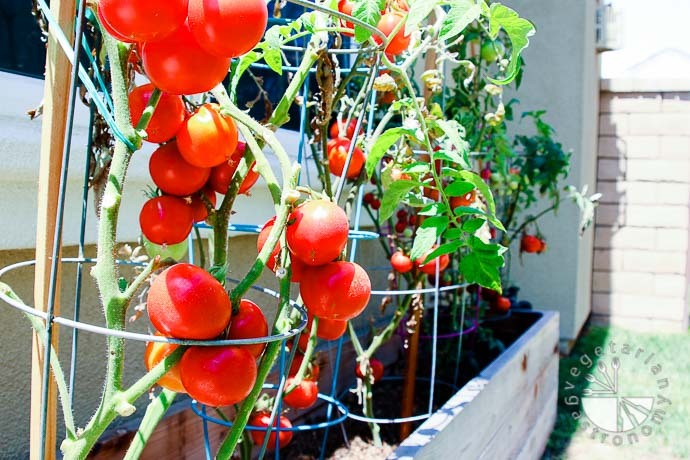 When they start to produce fruit, we sometimes have 40-50 vine-ripe tomatoes and 60+ cherry tomatoes ready to be picked and used! Early this summer I was away for more than 2-3 weeks, resulting in a plethora of tomatoes that ripened all at once. After having gone through the loss of my father, gardening and cooking this past summer had become somewhat of an outlet for me, a way to keep myself occupied. Both my kids love picking and eating the cherry tomatoes straight off the plants. We also find ourselves having fresh sliced tomato salads with some salt and freshly ground black pepper every day. Aside from that, I decided to make a few dishes that really showcased our delicious, juicy tomatoes. 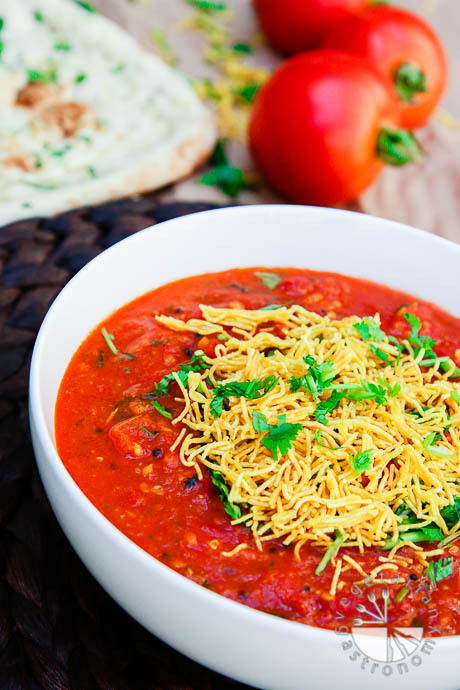 The first one was Tomato Sev Curry, one of our favorite traditional Indian Gujarati dishes. 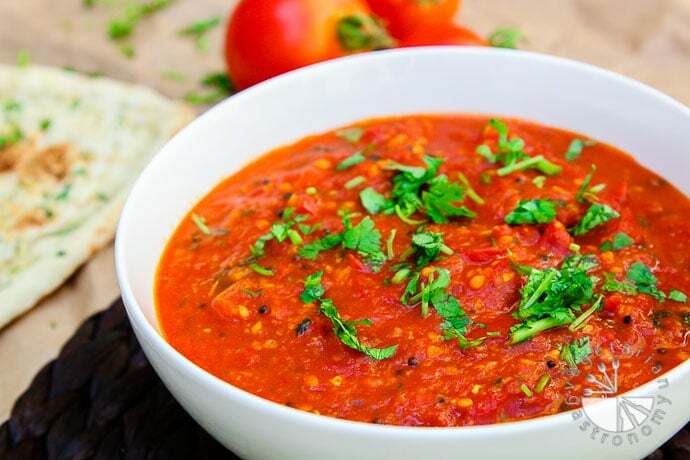 Tomato Sev Curry is simple and quick, but delectable method of prepping tomatoes. This dish is composed of fresh tomatoes, tempered with black mustard seeds, garlic, ginger, and spice, and served with or without Sev. 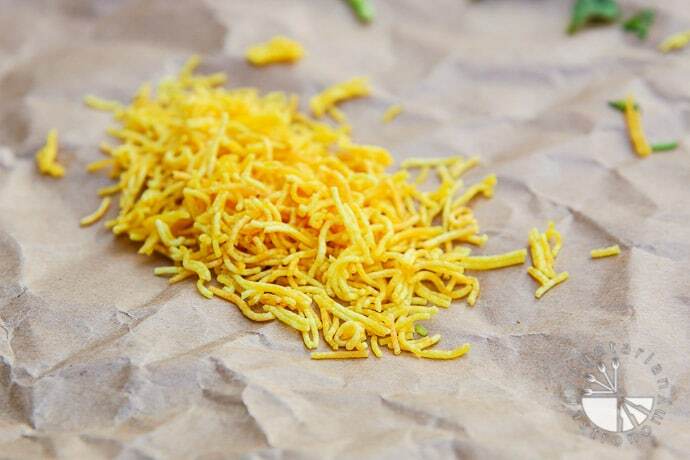 Sev is a deep-fried vermicelli-like Indian Snack. It is made by combining chickpea flour (gram flour), salt, spices, and water into a dough and pressed directly into hot oil with a Sev Machine that comes with many pre-fabricated molds that prepare Sev of varying thickness. For this dish, I like to use the thinnest possible strands of Sev. I have yet to make my own Sev at home, and typically get it pre-made by my mom or mother-in-law, but you can easily find it at almost all Indian Grocery Stores. For the purposes of this recipe, you can easily choose to include or omit Sev. 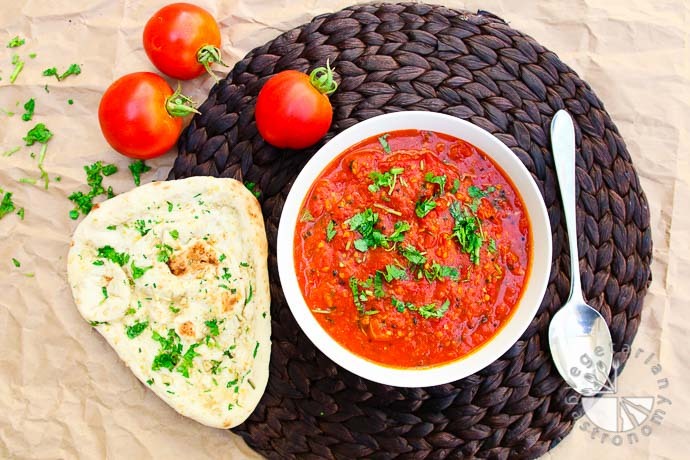 In either case, you will have a delicious, tasty, mouth-watering Tomato Curry dish. So don’t worry if you don’t have Sev laying around, or time to find the nearest Indian Grocery Store, because I have enjoyed this dish many times without Sev. I adapted this recipe from my mom by adding some additional ingredients, such as garlic and ginger, in order to really bring out all the flavors. The difference between this dish and my previous Indian Tomato Curry recipe (featured as the Reader Recipe in the September 2014 issue of Vegetarian Times Magazine!!!) is that this dish is not meant to be a creamy curry. 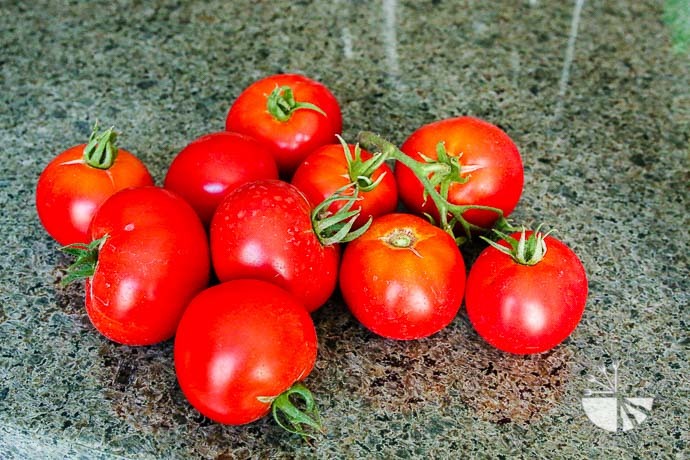 Instead, it showcases a tomato’s natural flavor of acidity and sweetness, especially of home-grown tomatoes. 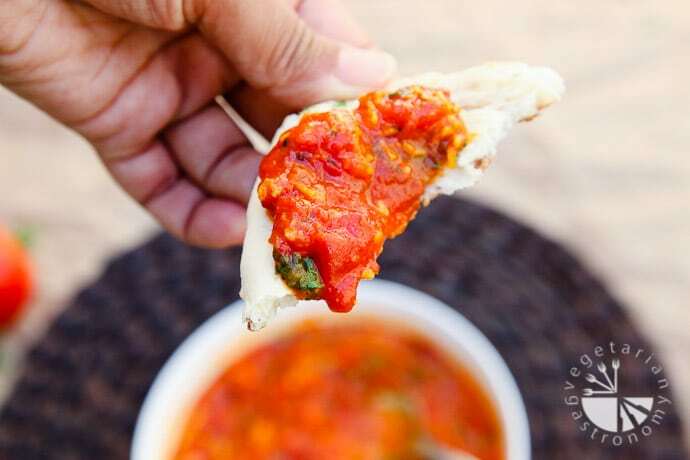 This dish is best served hot with a side of rice, Pulau, Naan, or your favorite home-made Roti. When I don’t have the time to make some fresh Roti, I typically eat it with some rice, or Trader Joe’s (TJs) Frozen Naan that I usually have in my freezer. TJ carries frozen Plain and Garlic Naan in packs of four. Nothing beats fresh breads, but the Trader Joe’s Naan is pretty close. Also, some additional news in the Food World: this month is VeganMoFo (Vegan Month of Food) 2014! The idea behind VeganMoFo is to create greater awareness for Vegan Food. So in honor of VeganMoFo, I will only be sharing Vegan Recipes and Posts this month (including on Facebook, Twitter, and Instagram) to help demonstrate what Vegan Eating is all about. Most of my recipes, especially those in the past 2 years, are or can easily be made vegan. Here are a few of the many benefits of Vegan Eating: sparing animals (#1), healthy eating, environmental conservation. Please help spread awareness for Vegan Food this month! 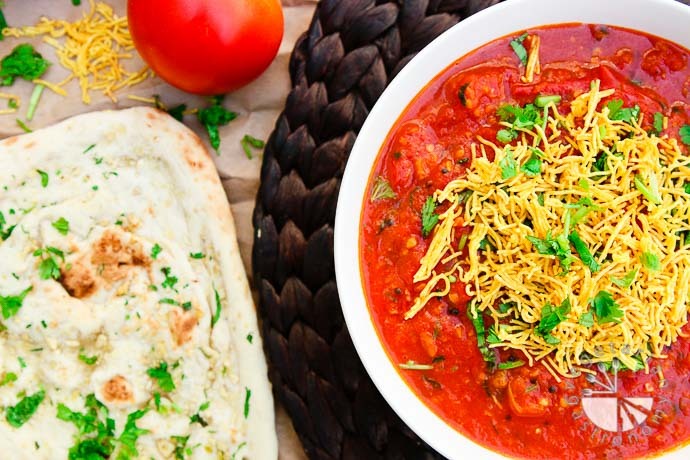 If there's one dish you NEED to make with fresh tomatoes, it's this Indian Tomato Curry with drops of fried thin chickpea strands! 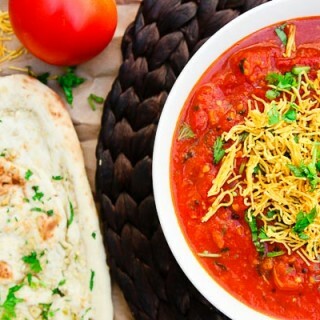 Enjoy it with a side of Naan or some cooked rice! Add the black mustard seeds and asafetida. Fry for a few seconds until fragrant. 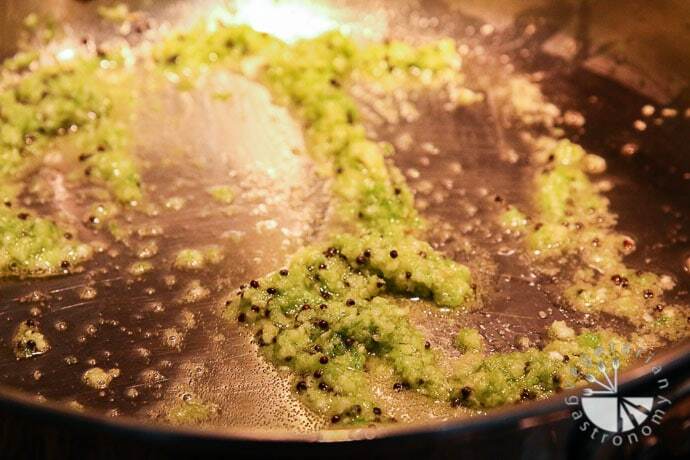 Immediately add the minced garlic, ginger, and jalapeno. Combine and fry until fragrant (~30sec-1min), stirring continuously to avoid burning. Add the diced tomatoes, ground cumin-coriander powder, and turmeric and combine. 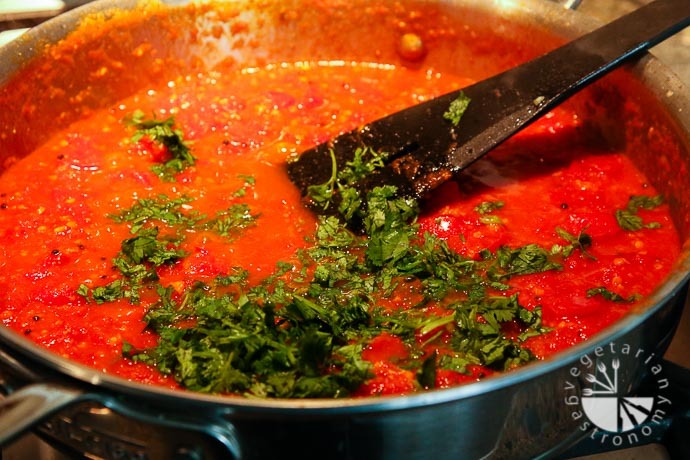 Bring the curry to a low simmer by adjusting the heat. Cook the curry, uncovered, on low-medium heat until the curry has reduced to about 1/2 the original volume (about 15-20min, depending on how juicy the tomatoes are). Season with salt and sugar to taste. 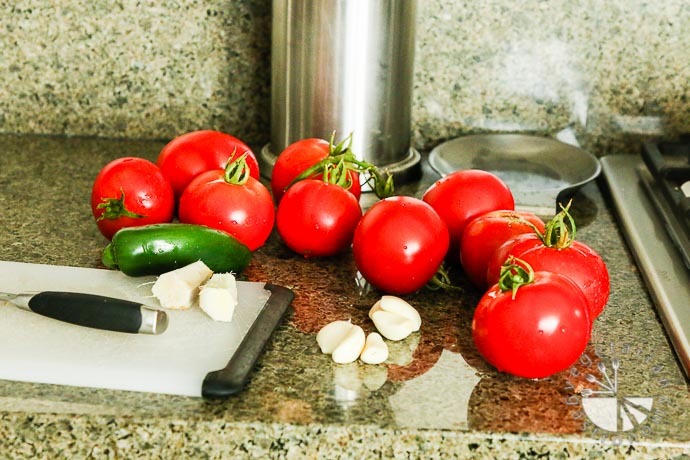 Exact amount will vary based on the flavor profile of the tomatoes (i.e. acidity & sugar). Add in the freshly chopped cilantro and cook for another minute. If using, add in the Sev just prior to serving (see notes below). Serve hot with a side of rice, Naan, or Roti. For this dish, use the thinnest possible strands of Sev. You can prepare the tomato curry ahead of time, but if using Sev, add it in just prior to serving so that it stays slightly crispy. Feel free to omit the Sev altogether in this recipe. Great post! Love the pictures. I need to get my garden into gear!! YES...do it! I should have dropped off a huge bag of tomatoes this year...we were gone for so long this summer that when I came back I had 90+ tomatoes I needed to use within a week! I did it, but too many tomatoes haha! They are too delicious to let go to waste. Until then, come pick up a pomegranate! With Home grown Tomatoes With Sav -curry was very testy. We liked it with Nan.